After closely watching the original tape of the December, 2005, destruction of the world’s largest medieval Armenian cemetery by Azerbaijan’s army, I was able to identify one – if not the only – participant of the destruction who wasn’t uniformed. 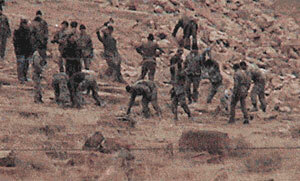 Taped on December 15, 2005, by members of the Armenian Church in Tabriz from Iran’s territory, the video showed a middle-age man – unlike the young soldiers – dress in a black suite and directly supervising the dumping of the Djulfa cross-stones to the River Araxes. The same man was also taped on December 16, 2005, at the same location at this time avoiding directly looking toward the Iranian border. Several soldiers were spotted using binoculars to look toward the Iranian border – they had apparently noticed the film crew that was taping them from across the border. So, according to Azerbaijani nationalists, I have some sort of access to the Britannica website where I can post my “false” articles. Actually, I only found out that Britannica had republished my article after I did Google search on the History Today article. “Website www.djulfa.com registered by Armenians falsifies the history of Nakhchivan, integral part of Azerbaijan, posts claims that this territory is an ancient Armenian land and false footages (sic) that Azerbaijanis destroy Armenian monuments in Djulfa,” parliamentarian Ganira Pashayeva told APA. She said that the website named Djulfa is the next subversion of Armenians against Azerbaijan and added that all should worry about the fact that Armenians have squatted some of the domains connected with the names of Azerbaijan, Karabakh, Baku, Sumgayit, Nakhchivan and the occupied regions. “The measurers (sic) should be accelerated for returning such domains, including www.djulfa.com to Azerbaijan and informing the world community about subversion against Azerbaijan. The relevant bodies should work out the process of registration of domains connected with the name of Azerbaijan in order to prevent such a problem in future. We should inform the world community on the level of media outlets, different embassies and Foreign Ministry that the materials posted on this website are false,” the parliamentarian said. Ganira Pashayeva said that Armenians are anxious about our informing world community about vandalism acts of Armenia and their destructing cultural-historical monuments belonging to Azerbaijanis in occupied Azerbaijani regions including Nagorno Karabakh and historical lands of Azerbaijan and areas called Armenian Republic today and Armenians want to confuse international community. “Not touching upon Armenian church in Baku is the indicator of the position of Azerbaijan in such issues. But all religious monuments belonging to Azerbaijan were destructed in Armenia today. This fact is enough for criticizing Armenians. To our regret, Armenians and their scientists posted articles covering these absurd and false claims against Azerbaijan in several encyclopedias, including Britanica (sic) encyclopedia,” she said. MP stressed necessity of establishing body under one of the relevant state organizations for removing and observing this aggressive policy of Armenia against Azerbaijanis virtually. Aimed at spreading awareness about cultural cleansing in the Republic of Azerbaijan, a project to document the deliberate destruction of the world’s largest medieval Armenian archaeological site has been launched online. The Djulfa Virtual Memorial and Museum (www.djulfa.com), announced in January of 2008, claims to be the foremost online resource on the medieval cemetery in old Djulfa (Jugha in Armenian), which was reduced to dust in December of 2005 by a contingent of Azerbaijan’s army. The destruction, videotaped by a film crew at the Iranian-Azerbaijani border, and condemned by the European Parliament, has been denied as “slanderous information” by officials in Azerbaijan. The newly launched project includes film and reference material on the history and destruction of the Djulfa cemetery. The Photo section features a number of previously unpublished images of the cemetery taken by French-Lithuanian art critique Jurgis Baltrusaitis, who visited the site in 1928. A publication co-authored by Baltrusaitis has also been digitalized and posted on the website. The Djulfa Virtual Memorial and Museum is maintained by volunteer staff and an advisory board. Learn about the annihilated sacred stones at www.djulfa.com. Afghanistan’s famed Bamiyan Buddhas, reduced to dust by the Taliban in 2001, may be returning in a few years. Japanese artist Hiro Yamagata, according to Bamiyan Laser, is working on a project that in June of 2012 will display Buddha images at the site where the sacred monuments were destroyed by Islamic militants. 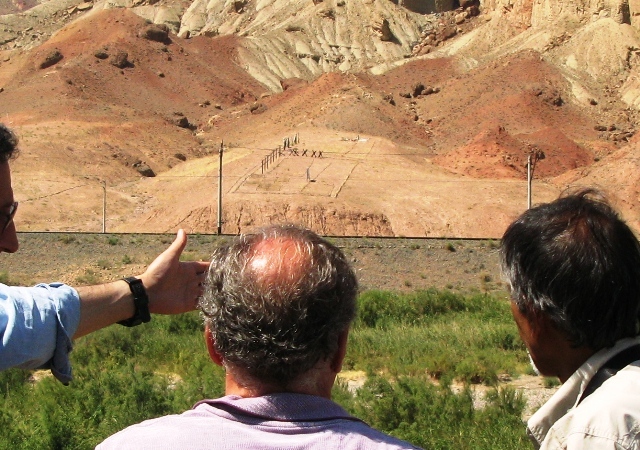 Over 250 laser systems installed 500m,1km and 5km in distance from the Bamiyan hills will project multiple layers of original Yamagata Buddha images drawn in striking colors. The laser images will be projected for 1 hour after sundown, 6 days without friday. The laser systems built specifically for this installation will shoot long range green beams and short range multiple color beams, designed to create a striking contrast to the purplish red hue of the Bamiyan sunset and the black mountain shadows. The energy used by the laser systems will be produced by environmental friendly windmills and solar power plants. The power produced is also meant to provide light and electricity for the people of Bamiyan. The original Bamiyan Buddhas were created approximately 1500 years ago, as one of the most significant historical monuments of mankind. My artistic concept is to create original images of Buddha and project them with the most unique,powerful and cutting edge laser technology of today onto the site where once the ancient Bamiyan Buddhas stood. Thus we will be able to revive the great creative spirit of mankind which produced the Great Buddha of Bamiyan centuries ago. A collaboration of ancient and new art will become a cultural icon of revived civilization in Afghanistan. By permanently creating an artwork of laser system installation in Bamiyan, we intend to stimulate both the land and the people of Bamiyan. But instead of the handful Buddha statues destroyed by the Taliban, the laser project will have 160-240 Buddhas. The figure gives hope that destroyed historic sites with hundreds of monuments can be “recreated” through laser imaging as well. A similar project could be put together to memorialize the largest medieval Armenian cemetery reduced to dust in Azerbaijan in 2005. What about “recreating” the New York Twin Towers with laser? The cemetery should be recreated – whether on Azeri or Armenian territory – before the 10th anniversary of the destruction of Djulfa. So there is much work to do until 2015. Interestingly, that is also the 100th anniversary of the Armenian Genocide. History repeats? Some Djulfa Monuments in an Azerbaijani Museum? In a post for the Djulfa blog, I raise the possibility that some monuments lacking inscriptions and Christian symbols from the famed Armenian cemetery of Djulfa – reduced to dust by Azerbaijan in December of 2005 – have been transferred to “The museum under opened heavens” in Nakhichevan City, Republic of Azerbaijan. Hundreds of the Djulfa monuments were ram-shaped memorials that seem to originate in pagan Armenia. Many of these didn’t have inscriptions on them, so it is likely that some of the Djulfa ram-shaped monuments have survived. In fact, the official website of Nakhichevan exclave’s Azerbaijani authorities mentionsthat in 2002, the year when Djulfa’s destruction was underway, a new museum was created where rock monuments were brought from different regions. The full post and a photograph from official Azerbaijani website of what appears to be a Djulfa monument is available here. A columnist in Lebanon calls for establishing Commemoration Day for the Destruction and Desecration of Nakhichevan’s Armenian Heritage in an article on the eve of the second anniversary of the world’s largest ancient Armenian cemetery’s demolition by the Republic of Azerbaijan. Writing for Lebanon’s largest Armenian-language daily newspaper, Azdag Daily, columnist Avo Katrjian recalls in his December 12, 2007 (received in e-mail as .pdf) piece that two years ago this month Azerbaijani servicemen were videotaped as destroying cemetery memorials in an ancient Armenian site that testified to the long presence of the Armenian people in Nakhichevan. The article draws parallels of Turkey’s treatment to Armenian monuments to that of Azerbaijan’s and concludes that there are the same. It would be fair, nonetheless, to note that there are many Armenian monuments that still stand in Turkey while in the Republic of Azerbaijan every single one of them have been reduced to dust. As Azerbaijan has been denying the destruction by claiming that there have never been Armenian monuments in Nakhichevan because Armenians didn’t live there, Katrjian reminds that Nakhichevan’s flag adopted in 1937 – when Nakhichevan was already part of Soviet Azerbaijan – had the word “Nakhichevan” written in Armenian and Azerbaijani. 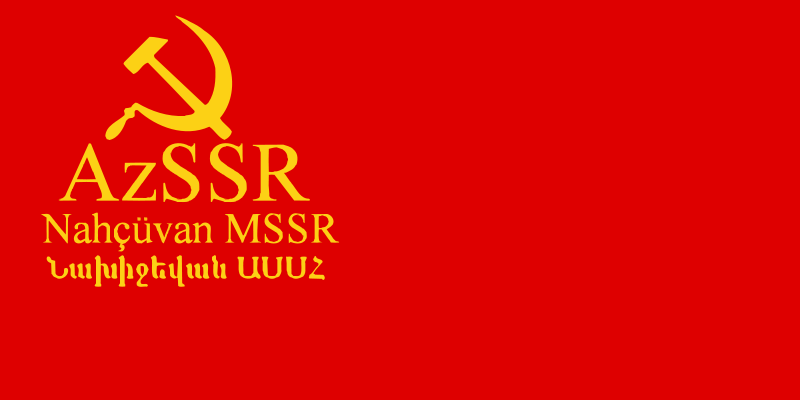 Wikipedia has the 1937 Nakhichevan flag (said to be Soviet Nakhichevan’s very first) posted in its short entry on Nakhichevan ASSR (or the Nakhchivan Autonomous Soviet Socialist Republic). The full post is available at Djulfa Blog. Sacred Stones Silenced in Azerbaijan. Those of you who can’t afford subscribing to Britannica or History Today to read the article, send me an e-mail and I will share it with you with the understanding that you won’t republish it. “Djugha” documentary about demolition of the ancient Armenian cemetery in Old Djugha (Nakhichevan) was circulated in the U.S. Congress. Expert in Armenian architecture Samvel Karapetian told a PanARMENIAN.Netreporter that 2000 copies of the film were distributed by the Organization of Armenian Architecture Studies in the Congress and Los Angeles basing NGOs. Mr Karapetian informed that copies of the documentary will be shown in Armenian, Russian, English, French and Turkish in 2008. “The documentary made a deep impression. After the Strasbourg screening some MEPs condemned Azerbaijan’s barbarian policy,” he said. With all due respect to the work of Samvel Karapetian and RAA in documenting destruction of Armenian heritage in Azerbaijan, Georgia and Turkey, the “Djugha” documentary I have seen is quite difficult to follow, unprofessional (it uses shoots from a Soviet-era movie about Shah Abas – Persian ruler who deported Armenians from Nakhichevan to Iran in the early 17th century) and somewhat racist (it ends with a western quote that basically says all that “Turks” do is destruction). I would suggest to Armenian organizations not to distribute this unproductive documentary, although the part on the actual December 2005 destruction is moving, depressing and unfortunately very real. The story of Djulfa’s silenced stones is too sacred and important to mis-tell it. 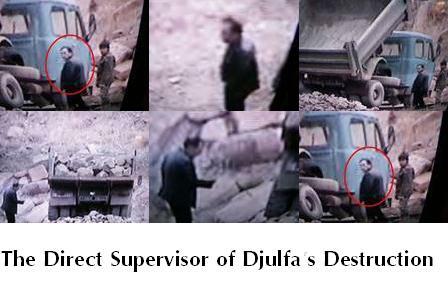 And, quite honestly, there is no professional film on Djulfa that I have seen that adequately tells the story. History Today, world’s premier and perhaps oldest history magazine, has my article about the Djulfa destruction in the November 2007 issue. The printed magazine, that includes three more photographs, should be available in most western libraries and many bookstores. The online version features the entire article with one photograph, but you have to pay to view the article in full. When, in the summer of 2005, Scottish researcher Steven Sim visited the region of Nakhichevan, an exclave of the South Caucasus republic of Azerbaijan, in order to study medieval Armenian monuments, he found out his trip was in vain – there was nothing there for him to research. After being detained and questioned by security police, Sim was asked why he expected Armenian Christian churches in a region where only Muslims lived. A villager, too, told him Armenians had never lived in Nakhichevan. When the researcher explained that a book had directed him to the ancient Armenian church in the village, an old man blasted out words in what Sim thought was German. The translator explained that the man was talking to him in Armenian, apparently to see if Sim was an Armenian spy. Knowing Armenian in a place where no Armenians ever lived seemed too awkward. But Sim did not confront Azeris in Nakhichevan about history. Neither did he resist orders to put his camera away in a military zone at the Azerbaijani-Iranian border when his train was passing by world’s largest surviving Armenian medieval cemetery – Djulfa (Jugha in Armenian). Sim might have done otherwise if he knew back then he was going to be the last known outsider in this remote area – on the border with Iran – to glance at the thousands of sacred and beautifully ….